From pig to man, and from man to pig again – Which is which? Opposite of Terror http://t.co/t8ivksJqIR – Orwellian acronym for “transportation security” doesn't protect from, but creates terror! Does the obsession with “terror” actually create terror? By definition, terror distinguishes a great fear . . . or an overwhelming intimidation against individuals and society. Tyrants use terror to control their populations, malevolent organizations use terror to cause mayhem, disrupt order and shatter the trust in the institutions they seek to overthrow, and rogue terrorists cause enough fear to let fear take over. Unfortunately, fear has taken over much of the world—and the world of travel itself. Twelve years after 9/11, our institutionalized knee-jerk response to the horrific terrorist attacks in New York and Washington, DC has festered and bloomed into a source of intimidation for all travelers. The Orwellian acronym for “transportation security” has achieved just the opposite by spreading a mood of terror and apprehension throughout the general traveling population. If the United States wants a “terror free world” then perhaps the United States should be a “terror free” nation. How might historians interpret this period in history? The great events in history, those events that cause massive change and realignment are not recognized until years later. In 2010 under the leadership of President Barack Obama, the United States of American began a series of attacks on the sovereignty of other nations. Some of these attacks were against the people of other nations using drones. Some of those attacks were against the banks, economies and societies of other nations using FATCA. These attacks united the world against the United States. Soon the resentment toward the United States was growing at a faster rate than the U.S. could defend against it. The United States realized it needed to stop the growth of the resentment and repair the damage. When the United States realized it’s mistake it looked to U.S. citizens abroad to be ambassadors for the U.S., to repair the damage/resentment it had caused. The problem was that between 2011 and 2014 the Obama administration had completely destroyed “U.S. citizenship abroad” leaving nobody to repair all the damage it had caused. The only U.S. persons left outside the United States were living in terror, hiding their “U.S. personhood”, and were hiding. Finally, the U.S. bankrupted itself by trying to protect itself against the resentment it had generated against itself. And that Dear Reader is how the United States as a world power ceased to be. It is possible to visit the United States today on a tourist visa. Make sure that you stop at the “FBAR Museum” in Washington, DC. But, try to stay away from the beggars on the street who are looking for food and shelter. 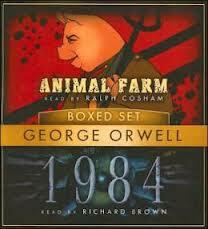 At the end of Orwell’s Animal Farm, the “pigs” had become indistinguishable from the humans who had oppressed them. With its drones strikes, FATCA strikes and more, one can argue that the U.S. government is behaving like the terrorists. Indeed, MIT professor, Noam Chomsky has argued that the United States is a leader in terrorism. 1. An ounce of prevention: I would try to understand and change the conditions that were causing people to want to attack me. For example, I might consider discontinuing drone strikes, FATCA strikes, etc. I would try to create conditions where there was no attack to defend against. 2. A pound of cure: I would create defenses to deal with a situation where I was attacked. Certainly I would recognize that war is expensive and as Colin Powell once said: “War is failure”. Two voices were shouting in anger, and they were both alike. No question, now, what had happened to the faces of the Obamas. The Homelanders outside looked from Candidate Obama to President Obama, and from President Obama to Candidate Obama, and from Candidate to President again; but already it was impossible to say which was which. This entry was posted in FATCA, FBAR and reporting, Land of the free, U.S. democracy, U.S. freedom, Uncategorized and tagged FATCA, Obama drones, Obama undermines constitution on June 11, 2013 by renounceuscitizenship. There is a quote which is stated to be from former President Clinton at Democratic Convention of August 2008. The quotes’s link takes one to the transcript of Clinton’s speech in the website of The New York Times. I read it many times but could not find the said quote anywhere on the page. Have I not looked too well or it is not actually there ? The Power of Example ? Watched the video portion.The quote is there alright, though not exactly the same as what was spoken.Actually it a true reflection of the position the nation has held – with – God’s blessings bestowed upon it.Thanks.